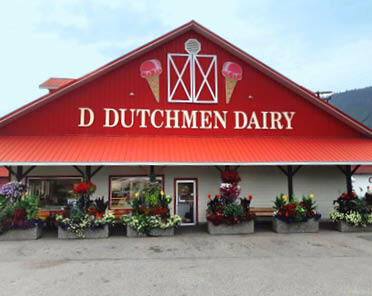 That’s not a typo: “D” Dutchmen Dairy is named for the Dewitt family, who came to Canada from Holland in 1960. Chris and Nellie Dewitt worked on dairy farms throughout the Fraser Valley before settling into their own dairy farm in Sicamous B.C. 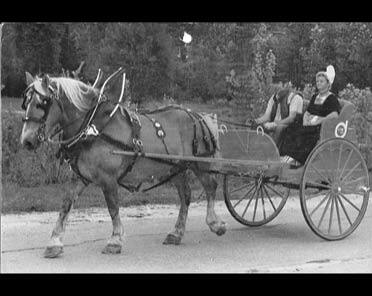 They originally sold their milk to another family owned dairy that made Armstrong cheese. But when Armstrong was purchased by a large company, they decided to strike out on their own. “He wanted to do his own thing,” Jake Dewitt says, referring to his late father Chris. That meant setting up their own processing plant on the farm to sell milk and ice cream directly to consumers. If you’ve ever driven that far west on the TransCanada Highway, you have almost certainly seen the big red D Dutchmen Dairy storefront. And hopefully you did yourself a favour and stopped in a for a scoop or two of their ridiculously indulgent ice cream. Today the company runs similarly to how it did when it started in 1978 (that’s 40 years in business if you’re not the mathing type). Jake now owns and operates the dairy processing plant and storefront while his brother Chris Jr. runs the Holstein farm that produces the milk and his sister Heidi works in accounting. It’s a family affair. And while most of the dairy is sold direct to consumers, we are one of the lucky few retailers that carry their coveted glass bottles on our shelves. 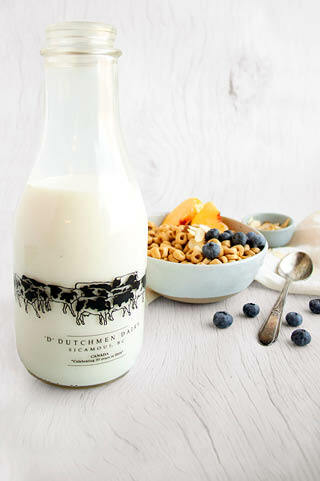 Those bottles are just one of the reasons for D Dutchmen Dairy’s legendary quality and flavour. The glass helps the milk last longer, says Jake, and is environmentally friendly. They’ve been using glass bottles for over 30 years, ever since tasting glass-bottled milk from Avalon Dairy. “It just tasted so much better,” he says. It also helps that they process their own milk, explains Jake. This gives them a guaranteed supply as well as full control over the product to ensure its quality. For example, they grow their own crops for the cows (except the grain which comes from Alberta). The cows roam in the pasture during spring, summer and fall and in winter they are loose housed in the barn, meaning they’re indoors but free to wander as they please. The cows are milked twice a day and the milk comes directly to the processing facility to be clarified, pasteurized and homogenized. It’s that processing that really separates D Dutchmen from other dairies, says Jake. Some producers pasteurize milk at high temperatures to create a longer shelf life. That makes it last longer, but it doesn’t have as much flavour, he explains. At D Dutchmen Dairy they pasteurize just above the required temperature and time to keep more flavour in their milk. I think the other thing that really separates D Dutchmen from their competitors is their impossibly rich chocolate milk. Alas, Jake is covert when I ask about it. Something about a trade secret. The good news is you can get D Dutchmen Dairy milk and cream for 15% off throughout October! And watch for their fan-favourite eggnog, set to hit shelves mid-November.